No, this wasn’t the irritating question by a cold caller from New Delhi. It was what Matt Roberts was asked by the woman responding to his 000 call while he was under siege, for nearly an hour, from a gang of armed, rampaging youths. Police have since apologised to him for this outrageous incident, says the tennis club coach and manager, but it remains unclear how it could still have happened after years of public complaints about police response to calls for help. For Mr Roberts it was part of 46 minutes of terror last Friday night. He had returned to his home in the tennis club precinct in Traeger Avenue after Jake, aged 15, whose guardian Mr Matthews is, asked him to come home. A number of gang members had broken into the complex. With the gates closed for the night, the intruding youths climbed over the fence and a fight ensured. Jake had the upper hand. More gang members arrived and proceeded to smash windows and furniture in the clubhouse. By the time Mr Roberts returned home after 9pm, the number of attackers had grown to nearly 20, now armed with tree branches, timbers, broken bottles and knives. Mr Roberts, for their safety, ushered Jake and two young guests into a room of the house and was now guarding, on his own, the back door which was smashed in. He made two phone calls to 000. He was kept on hold for eight minutes the first time and 17 minutes the second, all the while being told to be patient. It was the second operator who clearly had never heard of Alice Springs, let alone the location of the tennis courts, now the subject of Mr Roberts’ exhaustive explanation, whilst making a lone stand against the mob which, in foul language, threatened to kill him. The situation was defused by the arrival of the mother of one gang member. At the beginning she too was aggressive, but when she recognised Mr Roberts as the club’s manager, and remembered he had arranged a special clinic for one of her children with tennis star Evonne Goolagong Cawley, she told the rioting youths to beat it – and they did. Three minutes later the police arrived. 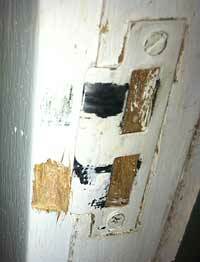 PHOTOS: A piece of timber used as a weapon in the assault, and the smashed back door of Mr Roberts’ home. We have jumped ship again. The issue is 000 the issue about the kids is another story. Back on direction what is happening with regards to call centre. I have heard nothing on any media not even an apology from commander Kate to Matt Roberts. So editor. What is the latest on the issues on the call centre and 000 issues. I am sure we are all waiting for information from our elected members. I agree we need an expert inquiry, and that may be under way with the Review of the Victims of Crime Assistance Act recently announced by the NT Government. My intention is not to fine an impoverished and overburdened granny. My intention is to find some way to make the kids responsible for the continuing breakage stop their actions, and if that means dragging their families into the equation, then so be it. For too long there has been too much of this not my kids / not my problem / poor bugger me response. Time to step up – own the kids and own the problem. Taxpayers are getting tired of replacing broken windows while the kids queue up to break them again. Hal (Posted March 3, 2013 at 5:45 am): we may well need an expert enquiry into what the options are. The problem here is that too often the person trying to care for many of these kids is a responsible but distraught, over-stressed, overwhelmed granny who is too scared to leave the kids in the care of parents whom she sees as being irresponsible, but who then overburdens herself with too many problems. Fining her is not going to help anybody, and will obviously make things worse. In some cases it may make sense to fine the irresponsible carer, but we need to have other approaches where fining the carer may not be the sensible thing to do. Automatic mandatory fining of carers would inevitably lead to injustices of the kind outlined above. How hard can it be to get a local to answer the phone? Too hard, apparently, but might not that greatly reduce the response-time? I can only imagine how terrifying it must have been to be attacked by teens, if they were even that old. And yet even if the police had arrived in a timely fashion, what could they have done other than to chill the immediate situation – as important as it was to do just that? The attacking kids went home again pumped with adrenalin after their rampage and knowing that nobody and nothing in Alice is preventing them from going berserk the next time it takes their fancy to do so. Is it time to start making the parents of kids still legal minors financially responsible for any damage they do? The police can’t do much more than chase them away from wherever they are misbehaving, the courts do the slap-on-wrist thing to seemingly zero effect, and we are millions of dollars away from a juvenile detention facility. So that leaves the family, which in carry-on-aren’t-we-a-great-culture terms we do hear a lot of. One objection I anticipate is that so many of these families are on Centrelink payments of various descriptions. But with the BasicsCard, basics like food and shelter are provided for, and that still leaves about half of the total available for discretionary spending. Well, if the child breaks something wilfully and illegally, start tapping into that. Oblige that family to start being a family all the time, not just when waiting in the dole queue. @1. Matt, Glad you are OK. I understand how frustrating it is when you call 000 and have to wait for ages, but can’t comprehend how scary it must have been with these clowns trying to get in, to try and smash you. No matter what happens in this town, Russell will somehow link it back to the “Rivers of Grog”. If a UFO touched down in the middle of the Mall, I guarantee Russell will find some “evidence” that it is the fault of some bottleshop. Do what many people are doing now, just ignore his rants. Smile and wave as his one-trick pony rides off into the sunset. I don’t remember any mention of these kids being drunk in this report, or how alcohol was even involved. The article was to do with a poor response to an extreme emergency, that could have worked out much worse. Nothing to do with alcohol, but an under-resourced police force and kids with no respect for the law, themselves or anybody else. Keep up your good work Matt and stay safe. Wouldn’t surprise me if a lot of other people didn’t know where Alice Springs was. When I used to work in the Alice Springs Post office, I saw addressed envelopes that had Alice listed in every state and the ACT, and even saw letters with stamps on them from post offices all over the country. @ Steve Brown. Feb. 26. If you check the references, including the medical journal Lancet and those who authored the report ‘Profits and Pandemics’, UK surgeon Professor Sir Ian Gillmore, chair of the United Kingdom’s Alcohol Health Alliance and John Patterson, CEO of the Aboriginal Medical Services Alliance NT (AMSANT) found in the article that you refer to, you will be able to verify whether my quoting of these sources is objective as published by the Alice Springs News Online editor to whom you appeal. The fact that you accuse these sources of “driveling propaganda” puts your hubris in some perspective. By suggesting that I have no sympathy for Matt is your usual assumptive form. The police already have a unit responsible for these kinds of criminal behavior. Check with them and report back to us if I’m incorrect, although, your law and order, big stick approach would be testing their patience, since you cannot see any way of admitting that alcohol-supply behavior is causing social problems, despite the coroner’s findings in the twin fatality motor vehicle accident currently being reported, involving one of the two premises about to receive independent assessors into the status of their contribution to alcohol-misuse in Alice. You might also share your thoughts on why the disproportionate number of those affected by alcohol-misuse in the NT are black and let us know how this works under your paternalism argument. My God what is wrong with the commander Kate running to the defence of the 000 call centre and doing all to discredit the victim of the horrendous criminal act. The trauma that Matt experienced whilst not obtaining assistance from 000 is only part of the problem it left him feeling like his death and or injury to himself and the kids in his care was imminent. Don’t go on radio attacking and victimising the victim because 000 failed in this incident. Take in on board and fix it. Look into how and why this happened. And you need to go on radio supporting victims of crimes not attacking and going all out to discredit them. Shame on you for this attitude. Your misdirection is obvious even to the blind. Being answered by 000 immediately in a situation like this is to be assured that help is on its way. And please, commander, enlighten us why there is propaganda for us to listen to about crime rates dropping when we call 131 444. You are police if we are interested in stats we will read about them the last thing we want is when in danger or reporting a crime that does not warrant calling 000 to listen to crime rates are down, break and enters on the decrease. What is going on when government departments and emergency services are promoting themselves by advertising. PR has gone too far, not to mention the wasted $100’s of thousand dollars to do this. What has happened to society that we let this type of behaviour happen in the first place? Today no-one is responsible for their actions and no respect for others or their property. All very well, all these deprived excuses but the behaviour should not be allowed by anyone, black, white, drunk or spaced out or just angry. Yeh it’s a real pity Ed that you allow Russel Guys driveling propaganda to be placed as a comment on every single article, it serves as nothing more than a distraction from the issues at hand which of course is Russell underlying intention, given that he is part of the self serving, parasitic industry of paternalism. In his comment Mr Guy once again demonstrates that he is incapable of empathising with his fellow citizens, blithely dismissing this incident that had one of the town’s foremost citizens barricaded in his home, placing himself between the attackers and the children he was protecting, being subject to racist bile and threats of death while his home was being smashed around him, the next day suffering a health collapse that has seen him flown to Adelaide. Mr Guy sees my call for action as a “budgetary matter” and a “big stick approach” which he dismisses as over the top in order to try and make another responsibility deflecting propaganda point about alcohol. It would seem Mr Guy actually believes that it is “not” the fault of these poor downtrodden rampaging teenagers who saw fit to attack Matt, who of course doesn’t actually count as a person in Russel world, given that he isn’t a victim of alcohol! No! It is all actually the fault of the alcohol industry, and this despite the fact that alcohol had absolutely nothing to do with this incident! We have abundant police at the moment, they are fully funded. I am asking that the police give special emphasis to cracking down on the kind of behaviour evidenced by this and other stories we are hearing. That won’t put any strain at all on any budgets. These incidents can be halted very quickly they should be judged and dealt with harshly as a deterrent, stopped in their tracks before they can escalate out of hand. Sometime the big stick approach is the right approach. I believe this is one of those moments. As for the CLP, I am not having a go at them in any way, just asking them to hurry up and try to deal with the disastrous mess left by years of idiotic Loopy Left Government called Labor! Thank God for the CLP, Russell! At lasts a chance to get something done! At last somebody in government with enough intelligence to talk to! At last somebody in government with the guts to at least take the risk of being wrong that you must take when you make a decision, something Labor never had the guts to do, which is why they failed so miserably! It is the Fawning Politics of Paternalism and socialism that has bought us to the brink of bankruptcy, Russell, not my kind that promotes self reliance, self responsibility, equality and less and less bumbling bureaucrats! Yippee!! CLP eee!!! Referring to the OOO debacle, where important emergency calls are dealt with by a remote [and dumb] switchboard; I would like to tell you about a policing initiative currently in use in South Africa. This is not a solution to the problems of Alice Springs, but it is a fine example of thinking outside the box. Townships, which are South Africa’s version of our town camps, only much, much bigger, are split up into zones and every zone has its own designated police patrol car and each patrol car has its own mobile phone and everyone in that zone has their number. So when a crime is happening you ring YOUR patrol car which is on the scene in minutes. Apparently crime has dropped by more than 70% in these areas. @ Steve Brown. You lauded the change of NT government at every opportunity and even on these pages (Henbury Carbon Farm), you continue to lambast Labor, but now we find you admonishing the CLP. Asking for a police squad while the police are mired in policing alcohol misuse is asking for more funding and testing their patience, when even the WA’s have admitted that politicians haven’t been listening to their police in this matter. It’s a complete no-brainer, Steve. Where’s the money budgeted for this? Bob Beadman is right – ideologies like yours will bankrupt the NT. When you gonna wake up? Asking the CLP to honour poorly conceived electoral promises is daft. They are so entangled in their own ideological rigging that they are at the pumps, night and day, pouring bilge overboard. Your big stick approach is more patented over-reacting bile. Every angle you’ve tried has come to zilch. You have maintained your resistance to alcohol restriction for the past twelve months on these pages, but I agree with you on one thing – come on CLP! Act before the ignominy of Federal intervention. Grasp the mettle of AMSAANT and legislate a floor price. Bring some sanity to public health in this part of Australia or risk going belly-up in the rivers of grog. Show some bipartisan, face-saving grit and bite the bullet. It’s a minute to midnight and the clock is ticking. Here we go again! Come on CLP! You promised to address this issue from the moment you gained government! It’s time we saw some kind of plan to rectify this ludicrously dangerous situation where people’s lives are being put at risk by what seems to be bumbling incompetence in the 000 technology. How can it possibly be so hard? Time to get it right! While your dealing with that its also high time this retaliatory, barefacedly racist behaviour, that seems to continue unabated in our town and just lately appearing to have escalated, of gangs of youths “paying back” anyone who has the affront to object to their out of hand violent and intimidatory behaviour has to be stopped! It needs to be dealt with in the most severe manner as it has the capacity to escalate to something much nastier. We don’t want Alice to become another Yuendumu! Payback activity of this kind invites retaliation leading to escalation! There must be Zero Tolerance for it! In this case the action of smashing into Matt’s home must be seen as a home invasion. In a number of incidents of this kind of which I am aware, parents, older siblings and relations also join in the fray, responding to calls from supposedly aggrieved family members. Adults, particularly parents, attending these payback assaults often actively participating thus condoning their children’s behaviour, should be charged with child abuse! They are clearly demonstrating to their children that this kind of Criminal behaviour is acceptable. Time the Territory Government instituted a rapid response police group charged with bringing this kind of behaviour to and end. If ever there was a group of prime candidates for Minister Elferink’s 15 day boot camp these kids and their parents are it! Although in my view parents teaching their children this kind of behaviour deserve something considerably more severe.